When it comes to one of the most important days of your life, why settle for just photos to look back on? A destination wedding in Thailand offers you the chance to get creative with your mementos and indulge in the romantic side of your personalities at the same time. A wedding day is so much more than a visual celebration. The colours of the day can easily be caught on camera, but it takes a lot more effort to capture the overall ambience of the wedding. A guestbook may go some way in recording the highlights of the day, but once the bride and groom arrive back home it is likely to gather dust on a bookshelf. Couples with an artistic streak often find a more practical way to transform wedding mementos is to turn them into decorative home accessories, from which they can continue to soak up the love each and every day. This is not a “tip jar” as you know it. Instead of a guest book, couples ask each guest to write their marriage tips or words of wisdom on colourful scraps of card or paper before dropping them into a jar. The coloured paper could even be decorated with glitter or patterns as an extension of your wedding décor theme. Once you are back home, the colourful jar can be displayed for all to see. 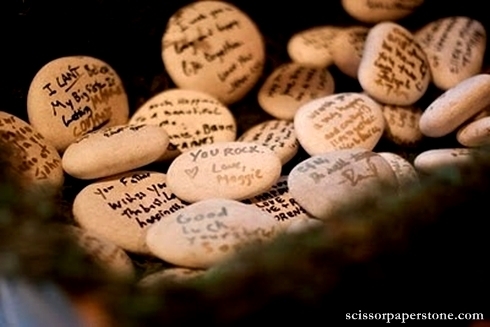 Couples tying the knot on one of Thailand’s idyllic beaches can even collect a basket of pebbles from the area and get guests to write messages on them in marker pen. That way, they can take home a memento that not only comes from their guests, but also the beautiful location of their marriage. The tree of love works perfectly for couples who like to display colourful art on their walls at home. Instead of (or as well as) a guest book, many couples now choose to have their guests sign-in on arrival at the wedding with their finger or thumb print rather than their names. Materials needed include a few colourful ink pads, a pre-prepared illustration of a leafless tree on a large canvas, and a group of enthusiastic guests. 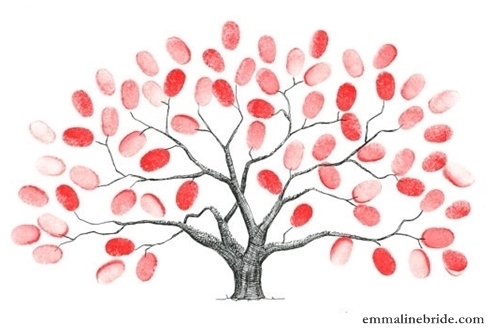 Each guest adds their own thumbprint leaf to the tree to wish the newlyweds good luck. As well as capturing the visual splendour of a wedding day, a wedding DVD records the sounds, atmosphere and the personal messages of the guests. The majority of couples appoint one of their friends or family as “Director of the DVD”, even if a film crew is hired for the job. It is then his or her job to make sure they capture all the memorable moments on film, not to mention the special low key moments scattered throughout the day. The Director can also make it their mission to record each guest’s good luck message and collect some “wedding wisdom” for the bride and groom to look back on once they start their lives together back home. 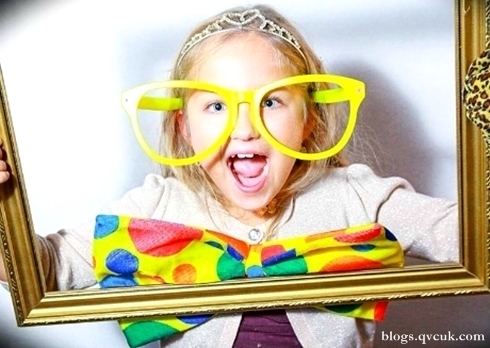 An increasing number of couples like to spice up their wedding day entertainment by setting up a photo booth or backdrop for guests to use throughout the day. With a bit of preparation, guests can even slip on fancy dress outfits and take on wild personas to be captured in a few simple shots that can be printed out into an elaborate collage for the bride and groom to display back home. Hosting a wedding at a private villa in Thailand offers the perfect opportunity for some traditional dressing up, and guests can have the time of their lives getting into character by donning the rich silks and sparkling jewels of traditional Thai costume for photographs. Fo creative couples that enjoy making a collage after the big day, a medley of wedding memorabilia can be combined in a single piece of shadow box art. Colourful wedding day titbits and souvenirs including invitations, photographs, flowers, speeches and itineraries can be displayed artistically in a shadow box. The striking visual effect of the collection makes for an elegant home accessory, in addition to a colourful reminder of a beautiful day. Some brides even choose to display their dresses in a shadow box rather than letting them gather dust at the back of a wardrobe.